So, yesterday I was thinking of things I love. Things like my husband, and my kitty, and running, and Diet Coke. And the Titanic. Yes, the Titanic. I’ve always been fascinated with the tragedy of the story and the mystery of all that lies beneath the surface of the ocean [and yes, Blue House roomies, of the happy memories of the movie]. On Sunday, as a last fun excursion before the semester begins, my husband took me to see the Titanic Artifact Exhibit in Indianapolis. It was really interesting to see all the artifacts and to read snippets of passenger and crew experiences on the ship/their journey that led them to Titanic. If you have the chance to go see this exhibit sometime [it travels worldwide! ], go see it–it is so worthwhile. I highly recommend it. Anyhoo… when thinking of things I love, this Caramelized Onion Dip instantly came to mind, and I found myself craving its smooth, creamy sweet and spicy taste. I can’t believe I haven’t shared this recipe here yet! It’s one of my new favorites. I made this Caramelized Onion Dip back in early December for our church’s leadership meeting, and I’ve been dreaming of it ever since… it is so good!! It’s one of those dishes that is so simple, yet so flavorful and versatile. Sweet caramelized onions with a dash of spice in a creamy dip… heavenly! We scooped up this dip with pita chips and crackers, but when I was prepping it, I may or may not have eaten it by the spoonful. Even my onion-hater of a husband loved it! I think I might be making it again soon… and may even be so daring as to spread it on a turkey sandwich. Yum! Hope you enjoy! P.S. Sorry that the pic is not the best… bad lighting in the convention center where we have church. Melt butter and oil in a large skillet over medium heat. Add onions, cayenne pepper, salt, and pepper to pan and saute for about 10-12 minutes or until softened. Turn heat down to medium-low and allow onions to cook for another 30-40 minutes, stirring often. Remove from heat when onions are browned, caramelized, and sweet. Allow to cool. Meanwhile, mix together cream cheese, sour cream, and mayonnaise with a stand mixer, food processor, or your own strength. 🙂 Stir in onions and serve with pita chips. If caramelized onions are in a recipe, I’m most certainly in 🙂 This dip looks fantastic–I’d love to incorporate into the baby shower I’m planning in March! oh i hope you do- it’s great! Mmmm, onion dip is the best!! 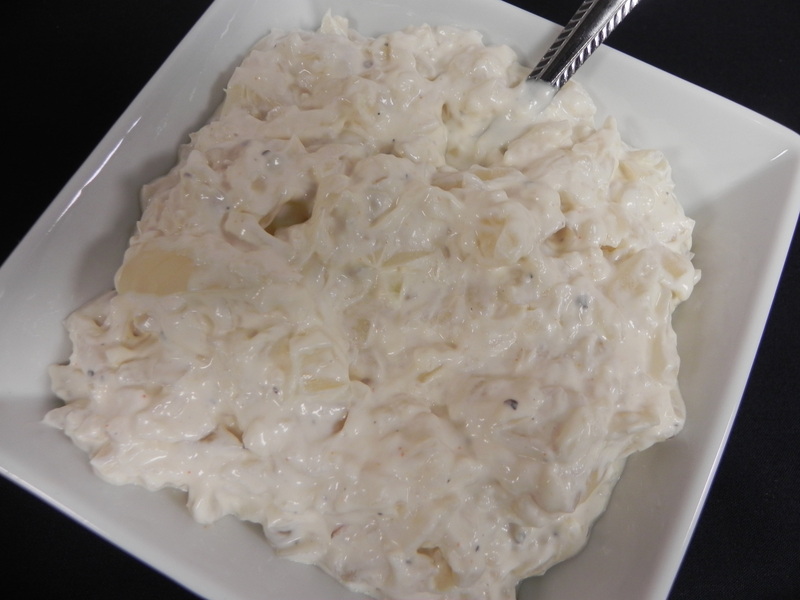 My favorite recipe for it is on Tasty Kitchen (I think it’s called sweet onion dip, or baked onion dip . . . I can’t quite remember, but it’s by whiteonricecouple). ooh i’ll have to check that out! 🙂 well, what can i say?? Oh this looks good. I miss onions. They are one of the foods I am avoiding, because Samuel has a reaction. This recipe is getting tucked away for when we’re done breastfeeding or they suddenly stop bothering him. I want to try it so badly! hopefully you’ll be able to do that soon!! i’d be lost without onions 🙂 i’m sure samuel makes up for it though- he’s so cute! Caramelized onions and I are serious lovers. This dip sounds delicious! Oh, my husband would love this! Definitely going to have to try! This looks fantastic; I LOVE caramelized onions. I’m wondering if there might be a substitute for sour cream, though, since they don’t have that in Spain. Any ideas? plain yogurt could be a good option, or creme fraiche. but here are 2 links that might help: http://www.food.com/recipe/substitute-sour-cream-153046 http://chowhound.chow.com/topics/331500. good luck!